The first novel of the Witchland series is ALMOST HERE! Join me to celebrate the launch of Truthwitch! Starting tomorrow, I’ll be discussing stuff like best friends, new years resolutions, and of course, fantasy books, tv and movies! And all in the spirit of Truthwitch, of course! The basic plan is to celebrate #TenDaysOfTruthwitch, starting on the US release date (January 5th) and ending on the UK release date (January 14th). Starting on January 9, I’ll be challenging YOU ALL to join in! 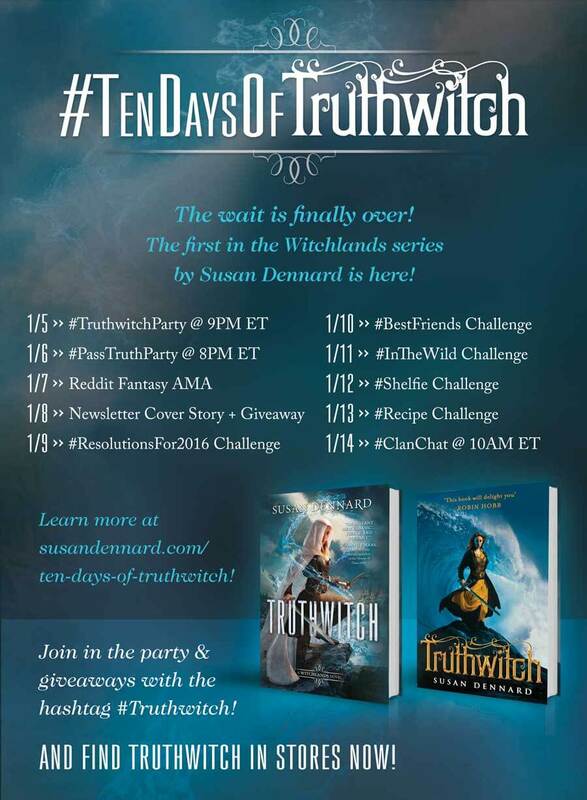 And each day, I’ll pick a random participant to win a signed copy of Truthwitch as well 2 other YA novels! Check out the graphic to the right or the full schedule below! Prizes: Beginning January 9th with the Reader Challenges, I’ll be giving away a copy of Truthwitch + two more novels EACH DAY! Rules: For the Reader Challenges, entries must be posted by 9pm ET on each date below. Winners will be chosen every night at 10:30 pm ET. International entries are accepted!!! 1/5: Truthwitch publishes in the US!!! #TruthwitchParty + a quick celebratory Twitter chat at 9PM ET! Make sure to use the hashtag #TruthwitchParty to join in! And there might be some prizes given away DURING the chat! 1/6: A live google hangout chat with moi & Alex Bracken at 8PM ET! Use the hashtag #PassTruthParty to ask Alex and me questions. We’ll each pick 10 to answer during the chat, and then we’ll take 5 more during the chat! 1/7: Reddit AMA on r/Fantasy! Drop by the forum any time during the day to ask whatever question your heart desires! 1/8: Misfits & Daydreamers giveaway + behind-the-scenes cover story! Learn how the cover for Truthwitch was crafted in my newsletter, and also enter an EPIC giveaway! 1/9: Reader Challenge #1: #ResolutionsFor2016! Show your bravery and share a truth! What do YOU want to accomplish in 2016? When posting, use both hashtags #Resolutionsfor2016 and #Truthwitch! 1/10: Reader Challenge #2: #BestFriends! Best friends 4eva! Friendship is at the heart of any adventure. Celebrate friendship by posting a pic of you and your Threadsister/brother using both hashtags #BestFriend and #Truthwitch! 1/11: Reader Challenge #3: #InTheWild! Getting that post-holiday shopping in? While you’re out, snap pics of Truthwitch by Susan Dennard in the wild and share online! Use both hashtags #InTheWild and #Truthwitch! 1/12: Reader Challenge #4: #Shelfie! Winter is…finally here. Post pics of your your fantasy book shelf, and you get a double entry if Truthwitch is on there! Use both hashtags #Shelfie and #Truthwitch! 1/13: Reader Challenge #5: #Recipes! Party treats time! Share a recipe for a fun snack inspired by your favorite novel, show or movie. You get a double-entry if it’s inspired by Truthwitch! Make sure to use the hashtags #Recipes and #Truthwitch! 1/14: Truthwitch publishes in the UK!!! Party time again, this time with #ClanChat! Join me and the #Witchlanders on twitter at 10:00 AM ET to celebrate the UK launch of Truthwitch! Clans, fans, and fellow authors will get together to talk about their favorite fantasy novels, shows and movies. Make sure to use the hashtag #ClanChat to participate! I hope to see you in the Twitter-verse, and if not there, then perhaps on the #PassTruthTour! 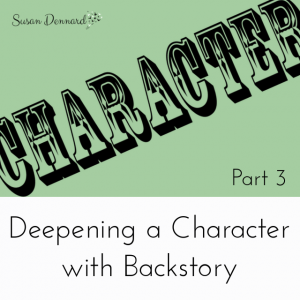 It turns out that in the course of writing the book, I had lost touch with my characters. In my defense, I took a looooong break while the first 150 pages were on submissions (many months of breaj). 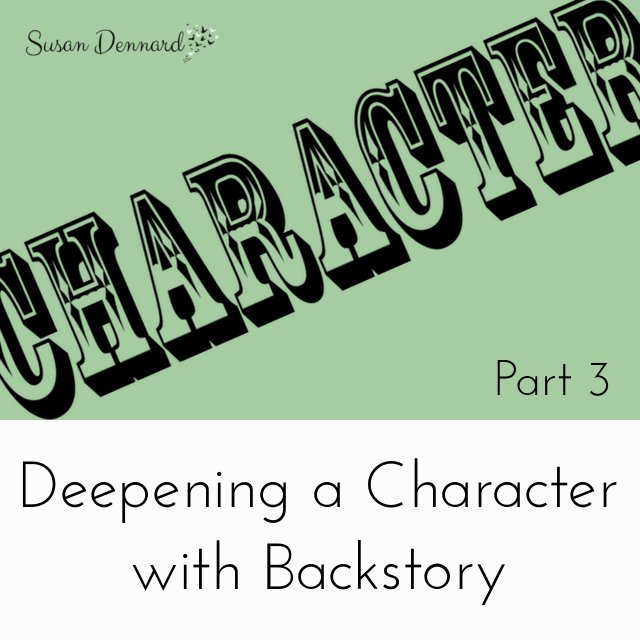 When I tried to wade back into the book once it had sold, I was disconnected from the characters. Totally disconnected–which has NEVER happened to me before. But I muddled onward anyway, finished the book, revised it thoroughly, and sent it off to my dear CPs. First 300 pages? Great! But the rest? Oh boy, there was something missing. It all worked on a plot level, but the story could be so much deeper and have so much more KAPOW. Then I rewrote the ending. Yep. Threw out >150 revised pages and rewrote them completely–new dialogue, new setting backdrops, new trajectory and choices. And AHHHHH, it felt good. The words poured like they normally do! More importantly, I sent the new ending to my dear CP, she flailed exactly as I’d hoped she would. 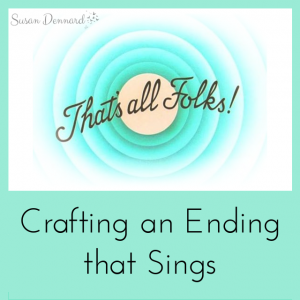 I’d nailed it–thank goodness! SO, all of that anectdote was to simply show you what I mean when I say: look at your dominoes before you write an ending. Look at the plot events–see how each domino hits the next until the climax. What event would need to come next based on all that has come before? It’s just like watching a super-satisfying domino display–it all fell where it was supposed to fall, even if we couldn’t quite see that ending from the beginning. New book deals + a newsletter thingy! I know I was supposed to give you guys the final steps of the Productivity Pyramid this week, but I found out rather suddenly that we were going to announce my new book deal today (instead of later this spring, as planned)…so DUH, new book deals took precedence!! Of course, learning we were going to announce also led me to dancinglikeacrazyperson around my office (and then almost fainting because I’m so out of shape), before I hunkered down to get a few things wrapped up that I had planned to launch alongside the new series announcement. But….LET ME ANNOUNCE TRUTHWITCH because if I have to type one more sentence without typing I SOLD A NEW SERIES, then I will probably die. I sold a new series, guys! Truthwitch is coming out in fall 2015! Obviously, I’m be freaking-out-excited about selling a new series, but what makes this SO SPECIAL is that it was acquired by Tor. TOR. As in the most well-known publisher of fantasy, sci-fi, and horror! And guys: Tor is probably my most favorite publisher of all time. When I glance at my shelves, half the books have the awesome Tor logo on their spines (and what a logo it is! All Mount Doom craggy epicness). 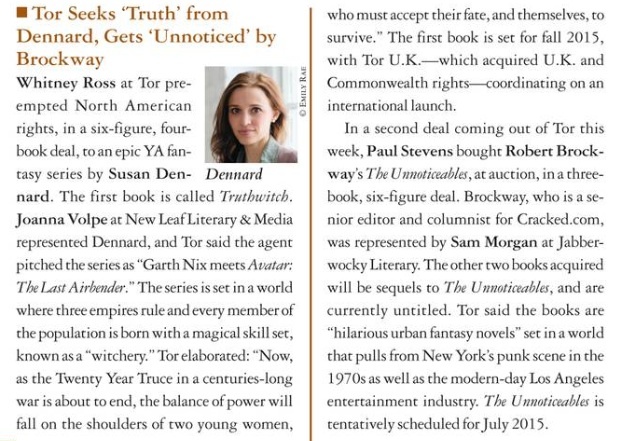 PLUS, Tor UK also bought Truthwitch in a separate deal, so I’ll finally have a book out in the UK!!!! That may not seem like a huge deal to all of you, but for me, it’s enormous for me. My whole goal is to reach more readers, you know? To connect with more people, so this is already a huge step in that direction! Poor Something Strange & Deadly just didn’t appeal to foreign publishers–it’s such a niche genre and I totally understand that. Just being epic fantasy has served Truthwitch well already. Remember what I said, like, two paragraphs up? About wanting to reach more readers? Well, that’s the purpose of The Misfits & Daydreamers. Basically, this will be a chatty newsletter PLUS a forum where I can interact with my fellow Misfits and friendly Daydreamers. 🙂 I’m hoping to connect with you all on a more personal level, and this newsletter/forum is the best approach I can find for that. I love my blog, I try to post as regularly as possible and with as much high quality + helpful content as I can create. But there is a built-in distance here. Even with comments and emails, I don’t feel like I know you all well enough–and I’m not sure you know me. You know about my writing advice, but I rarely delve into other things. So here’s my goal for 2014 and beyond: I want to know my readers better and I want you to know me. I also want to be able to give content (free extra scenes, book updates, behind-the-scenes publishing insight, etc.) to you directly–and I also want to know right away if you enjoyed that content or if it missed its mark. Now, in case you’re wondering about the name–Misfits & Daydreamers–I’ll explain. The Misfits was a name thought up by a fabulous fan for readers of the Something Strange & Deadly series. The Daydreamers are what I’ve decided to call readers of my blog and fans of my writing advice. As such, the Misfits forum and part of each email update will be for fans of my stories and books–things like teasers, cut scenes, interview, giveaways, etc. I’m hoping to share Strange & Ever After teasers along with Truthwitch teasers and any other fun stuff I have very soon! Then the Daydreamers forum and a portion of the emails will be for fellow writers and aspiring authors (or published authors too!). You can see my writing process in action, I’ll answer questions about writing, and I’ll basically offer insights and updates that I don’t offer here, on my blog. One really cool thing I plan to offer (or I think it’s cool) is a behind-the-scenes look at traditional publishing. Since I recently sold Truthwitch, I am in the very early stages of its publication process. That means I can share each step–from finishing a draft to revising with my editor to cover design and beyond–as it happens. And of course, I’ll want to hear from you guys–either in the forums or via email. 🙂 That way it’s a conversation and I can learn more about YOU over time. Okay, I am heading out now to eat leftover snickerdoodles and celebrate. I hope to see you soon, fellow Misfits and Daydreamers!